The company also announced it would defer drug price hikes, following pressure from President Donald Trump. Drug company Pfizer has announced it will reorganize into three units as it evaluates options for its consumer health-care business ahead of a decision this year. The company has been trying to sell its consumer unit since late last year, but as of May had no acceptable offers. The business is worth, reportedly, about $15 billion. Under the new structure, the company will be divided into innovative medicines, established medicines, and consumer healthcare units. It is currently split into an innovative medicines unit and essential health unit. The consumer healthcare business will account for about three-quarters of the company’s revenue and will operate semi-autonomously. The innovative medicines business will now also include biosimilars and a new hospital business unit. Consumer healthcare will include over-the-counter medicines. “This new structure represents a natural evolution of these businesses, given the ongoing strength of our in-market products and our late-stage pipeline and the expected significant reduction in the impact of patent protection losses post-2020,” Ian Read, chairman and chief executive officer, said. The changes will go into effect at the start of the 2019 fiscal year. In a separate announcement, Pfizer said it would defer price increases that were effective July 1 until the end of the year, or until the Trump Administration’s blueprint for health care goes into effect, whichever comes first. 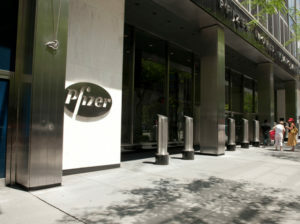 Pfizer said it made the decision following an extensive discussion with the president.